FILE - A man cuts wood as women prepare a meal in the camp for Central African refugees in Garoua Boulai, on the Cameroonian side of the border with the Central African Republic, April 28, 2014.
Business activity has come to a standstill as Cameroon has sealed its northern border with the troubled Central African Republic following escalating violence in the neighboring country. Cameroon says several of its citizens have been kidnapped and taken to C.A.R. by armed groups. Among the crowd was Julie Nelem, 25, whose uncle was kidnapped . She is very happy her uncle has returned, allowing her to continue to have money to fund her studies, Julie told VOA. She is happy that her uncle is home and alive. It is as if he died and has been resurrected, she said. The three former captives were freed by the Cameroon military after two days of cross fire battles with the rebels along the border. The most senior government official in the Cameroon border locality, Etienne Mballa Samba, says several Cameroonians in his area have been kidnapped since violence escalated across the border two weeks ago. He says more troops have been deployed to stop the rebels. He says the government of Cameroon has decided to seal its northern border with the Central African Republic to stop armed rebel groups from causing disorder. He says preserving lives is better than the negative economic consequences the closure will bring. Etienne says the rebels are from the eastern province of Haute-Kotto where there have been clashes between armed groups since June. 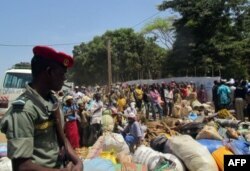 Cameroon supplies most consumer goods and food to troubled C.A.R., and the border closure has stopped business activity. There are fears food shortages in C.A.R. will increase in the days ahead if the border remains closed. The United Nations reports that since May 2017, fresh fighting between armed groups in C.A.R. has wrought new waves of destruction, bloodshed and displacement. 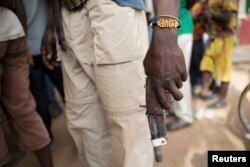 FILE - A member of the of an Anti-Balaka armed militia displays his weapon in the town of of Bocaranga, Central African Republic, April 28, 2017. Last year, 11 Cameroonians, including Mama Abakai, mayor of the northern town of Ladgo, were freed from captivity after they were seized by a rebel group from the Central African Republic in 2015. Last month, Cameroon handed over to C.A.R. war weapons they had seized from rebels hiding in Cameroon. Armed groups from the C.A.R. regularly cross into Cameroon to kidnap cattle ranchers and businessmen for ransom, or to steal their possessions. Cameroon shares a 900-kilometer boundary with the Central African Republic and hosts 300,000 refugees from the neighboring country.